Hello! Whow is it the 13th of September already? The year is just flying by! Some of the DT have little bundle of joys on the way and some have little grandchildren on the way so we decided to make this challenge theme BABIES in honor of all the new little ones coming into the world. 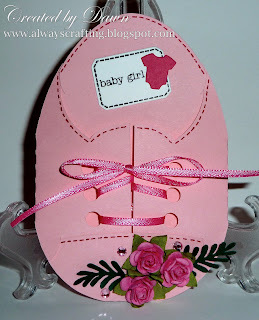 I made a baby shoe using my silhouette and MFT things tag. The silhouette has some really cool die cut designs! Head over to www.creativecardcrew.blogspot.com and enter your baby project today! What a great idea Dawn, this is gorgeous.